PARM organized a High Level Policy Dialogue workshop in Kampala on 29 November 2016, in collaboration with NEPAD and the Ministry of Agricultural Industry and Fisheries (MAAIF). Uganda’s agriculture sector is dominated by risk averse small scale farmers who still practices at subsistence levels and using rudimentary methods of farming with inadequate capacity to deal with a multitude of agricultural risks. It is estimated that of the 5.2 million farming households in the country in 2014, only 119,209 (2.3 percent) were in commercial farming. The risks therefore have significant impact on the sector and are further amplified by the constraints that small holder farmers face including; limited availability of improved and quality inputs, limited access to agricultural finance, weather hazards, pests and diseases, national and international economic downturns (prices), inadequate investment in the agricultural sector, unfavourable land tenure system and related shocks. According to recent studies the overall economic impact of agricultural risk is estimated between $ 606 to $ 804 million USD. Based on an agricultural GDP of $ 5.71 billion USD, losses therefore amount to between 10.61% and 14.08% of total annual production, and for Uganda that is between 2.3% and 3.1% of its GDP. To dialogue with the Government of Uganda on Agricultural Risk Management and how the ARM interventions incorporated into its policy strategies and investment plans can best be implemented. To ensure that the MAAIF and agricultural sector partners take the lead on ARM as a follow-up of the PARM process in Uganda now that the PARM process comes to an end. To present and discuss the feasibility study on crop pests and diseases and to validate the outcomes incorporating recommendations, additional insights and practises. To present and discuss the initiative on Financial Information and Risk Management Model (FIRM). With a focus on the implications of the private public partnership proposal, and agree on the required institutional and financial commitments to implement it by the private sector partners (FIT Uganda and Agri Risk Analyser) and MAAIF. To ensure that Agricultural Risk Management is mainstreamed and incorporated into the extension services strategy and investment plan of Uganda, and that the technical knowledge and capacity development efforts are capitalized by local institutions. A specific proposal to include ARM in the training courses and curricula of Makarere University will be presented and discussed as part of this initiative on capacity development. Institutional arrangements are taken for the setting-up and management of the three initiatives i.e. inter-ministerial coordination, creation of or strengthening existing public/private platforms and implementation of tools to be operated in cooperation between the private and the public sector or by the private sector. The High Level Policy Dialogue workshop took place at the Imperial Royale Hotel in Kampala. The Workshop has counted with the presence and input of the Minister of Agriculture (MAAIF), Hon. Ssempijja Vincent Bamulangaki, who outlined the Agricultural Risk Management (ARM) initiatives in the Ministry and expressed its appreciation for the ARM policy processes facilitated by PARM and NEPAD. Stakeholders, technical experts, policy makers and development partners met to engage in this policy process and in its current three specific proposals on: plan pest control, capacity development of extension services and public-private information systems for risk analysis. The workshop has permitted the dialogue between the government of Uganda, PARM, NEPAD technical specialists and donor agencies to ensure that Agricultural Risk Management (ARM) tools that have already been incorporated into policy strategies and investment plans are also implemented . 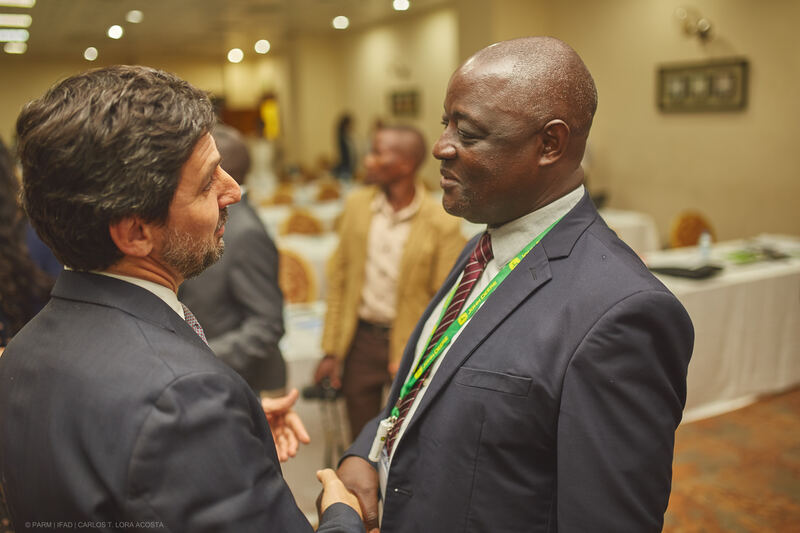 The MAAIF and agricultural sector partners will take the lead on ARM as a follow-up of the PARM process in Uganda now that the PARM process comes to an end. This follow-up work will continue to be facilitated by NEPAD and its continental CAADP policy framework. The workshop served to discuss three specific proposal that build on the ARM policy process of the last three years. It has been an evidence based discussion informed with several studies including the Uganda Agricultural Risk Assessment Study and feasibility studies made by experts on three different areas: plant pest control, information systems and finance, and ARM capacity development. PARM will follow-up with technical support when needed to facilitate the implementation of these proposals and the interest of development partners to support their implementation. NEPAD will continue supporting the CAADP policy process and implementation of risk management instruments and policy measures with a special emphasis on rural infrastructure development in Uganda, building on the results of this joint risk and tools assessment. A formal call for proposal will be sent to the Government of Uganda during the first semester of 2017. An action plan will be proposed for the follow up and implementation.